For some high school hoops teams, the twists and turns of playoff action have been both exhilarating and nauseating. Among the notable teams that have been knocked out of the postseason already: Keaau and Aiea. Keaau (20-7) was ranked sixth in the Star-Bulletin Top 10 last week, but a close loss at Honokaa gave the Dragons the regular-season Big Island Interscholastic Federation title and a state-tourney berth. A few days later, Keaau lost to rival Kamehameha-Hawaii in the BIIF semifinals and suddenly the season was over. Aiea was the top seed in the Oahu Interscholastic Association White West. A last-second loss to Thompson put a sudden end to Na Alii's otherwise outstanding season. Aiea (18-5) plays in a league that does not award a state berth for the regular-season champion. In another twist, Baldwin fell to Lahainaluna, giving the Maui Interscholastic League regular-season title -- and a state berth -- to Kamehameha-Maui. Baldwin has to win the MIL's playoff tourney to secure the second state berth. No. 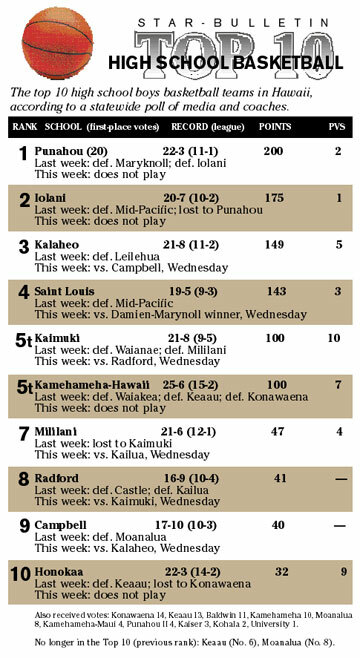 3 Saint Louis, which is behind state tourney-bound Punahou and Iolani in the ILH, has a tough road ahead. To get in, the Crusaders must win the Interscholastic League of Honolulu third-place tourney and then travel to the Big Island for a state play-in game against Konawaena, the BIIF's third-place finisher.